Theme is an idea that is central to a story and often is summarized in a single word. When a writer begins writing a story, he or she might not know the theme. Even later, the theme may not be obvious. When I began developing The Dragon Universe, I gave no thought to theme. The concept of theme was confusing, so I did not worry about it. Then, one night, as I talked to myself about the story, working through details, an epiphany occurred. The following describes the story. Backpacking had been a leisure pursuit until Les came upon a prefab, forest manager’s cabin that turned out not to be a cabin. He now struggles to survive on an alien world using only his wits and his backpack’s contents. Encounters with strange creatures, animal-like people, and a terrifying Dragon challenge his sense of reality as he finds himself in the midst of a struggle that will determine the fate of many worlds and will send him on a journey to his destiny. My epiphany was that the story’s theme is love. I realized most of my stories were at their core about love. I have a soft heart and my stories bring that out. Stories that involve loving characters who work together as caring partners toward a common goal triggers an emotional response that I think was always there, but until now had been unnamed. This brings me to why this comes to mind. 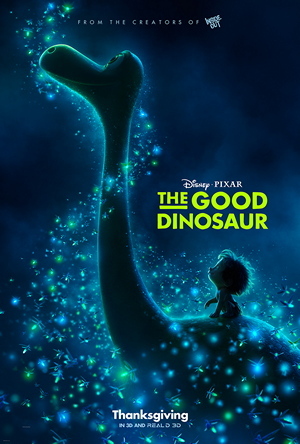 The movie trailers for The Good Dinosaur (2015) trigger that emotional response. The tag line “A single kindness can change everything” touches me. Knowing Arlo’s situation makes me feel for him. Having Spot help Arlo and join forces with him makes me rejoice. I have high expectations the story will affect me deeply. I hope it does not disappoint. The Good Dinosaur will be in theaters on November 25, 2015. I look forward to a significant emotional response. I strive for my stories to do the same for my readers. Arlo lost, alone, and frightened. I feel for him. Spot comforting Arlo brings tears to my eyes.